Cartier’s in-house perfumer, Mathilde Laurent is one of the greatest olfactory artists living today. She has an innate ability to subvert familiar fragrant themes, twisting them with a dash of something unusual or humorous. At Cartier she has consistently created surprising and fascinating scent pieces, elevating the Parisian jeweller to it’s current position as a go-to fragrance house for those looking for luxury, quality and artistry all wrapped up in a beautiful package. Mathilde Laurent is a living legend (and if you need further proof you can read my interview with Mathilde here). Cartier has recently launched another Laurent composition entitled ‘Baiser Fou‘ (‘Crazy Kiss’) – a scent inspired by lipstick kisses. Baiser Fou follows Baiser Vole in Cartier’s series of floral-focused fragrances and where the Stolen Kiss was an ode to lilies, it’s bonkers counterpart is a celebration of the orchid, with Laurent inspired to recreate the elusive smell of lipstick using the “intense powderiness and sweetness” of the orchid. Now, orchids aren’t exactly known for being particularly fragrant or you know, having the actual ability to yield a fragrance oil, so all orchid fragrances are very much a construction and Baiser Fou is exactly that – a fantasy flower. 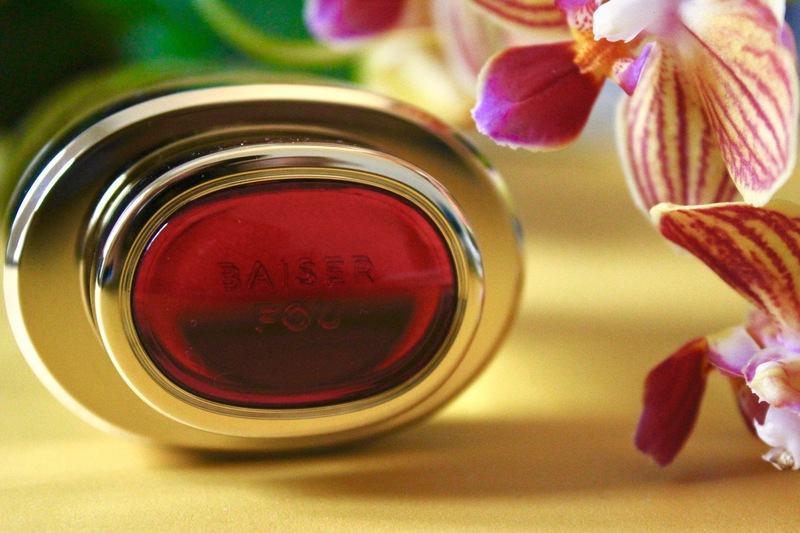 Baiser Fou opens fruity and glossy, with lots of dewy sweetness finished with a brilliant sheen. I want to say that it smells like watermelon lipgloss, but I think that almost dumbs down the beauty of these top notes. So maybe if you could imagine a luxurious watermelon jelly of sorts, with a few juicy red berries squeezed on top for good measure, then you’re on the right track. Up top it’s all strawberries, bubblegum and bright red lips, and it’s utterly fabulous. The orchid heart is luminous and prismatic, whilst boasting a coolness that is seldom seen with exotic blooms. The petals of this orchid are thick, brightly coloured in yellow and pick, and they’re covered in dazzling dew. Baiser Fou’s most beautiful trick though, is a stem-like green quality that contrasts the fruit and floral notes. This note is vivid and spicy, providing much needed depth and darkness to what would otherwise be a folly of sugar, making for a something more vibrant and complex. Softness comes in the base in the form of vanilla and white chocolate. Baiser Fou’s fun-loving festival of fruit and flowers rests upon a bed of plush, velvety cream. Subtlety is key here and it’s safe to say that Baiser Fou never feels overtly heavy on the vanilla (it has a freshness to it that stops any heaviness) or the white chocolate for that matter, instead it paints the image of orchid enfleurage – where yellow and pink orchid petals are delicately pressed into a frame filled to the brim with delicious cocoa butter. Delightful. Baiser Fou is beautiful. I cannot think of another fragrance that smells like it and that really is high praise. As always, Mathilde Laurent has created something completely unique – a familiar theme with fascinating twists and turns. Baiser Fou is not your typical orchid scent (there’s not a hint of the tropical in sight), nor is it your typical ode to lipstick (no powder here, folks). It’s not even a standard fruity floral and for all of these reasons Baiser Fou should be on your sniff list, after all, it’s not hard to fall something strange and beautiful, like watermelon lipgloss (sorry, had to be done). Baiser Fou is available in 30ml (£51), 50ml (£69) and 75ml (£86) Eau de Parfum. Posted in Cartier, Feminine, Floral, Perfume Reviews and tagged Baiser Fou, Cartier, Feminine, Floral, Fragrance, Mathilde Laurent, Perfume, Perfume Review. Bookmark the permalink.